Today – Wednesday, May 9, to be more specific – is a minor landmark day in the NFL this offseason. It's the first day that teams can sign unrestricted free agents and not have them count toward the compensatory pick formula. If you're unaware of the mysterious and confusing world of compensatory picks, you can catch up to some degree here, but the CliffsNotes version is that teams that have lost more free agents than they gained during free agency are awarded free draft picks the following year for some dumb reason that I have yet to figure out. 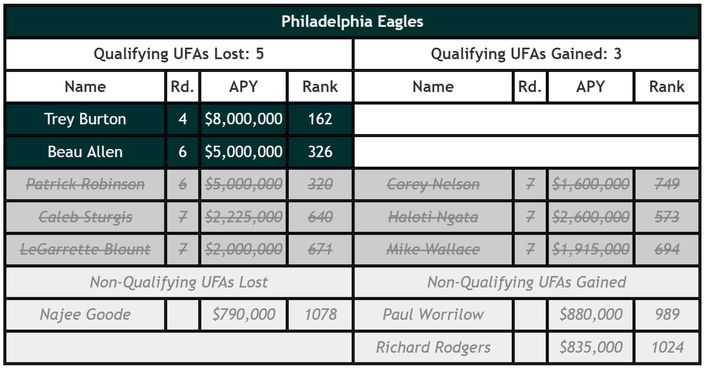 This offseason, for the first time in a long time, the Eagles lost more free agents than they gained, and are thus in line for some of those sweet free draft picks in 2019. What does the chart above mean, exactly? 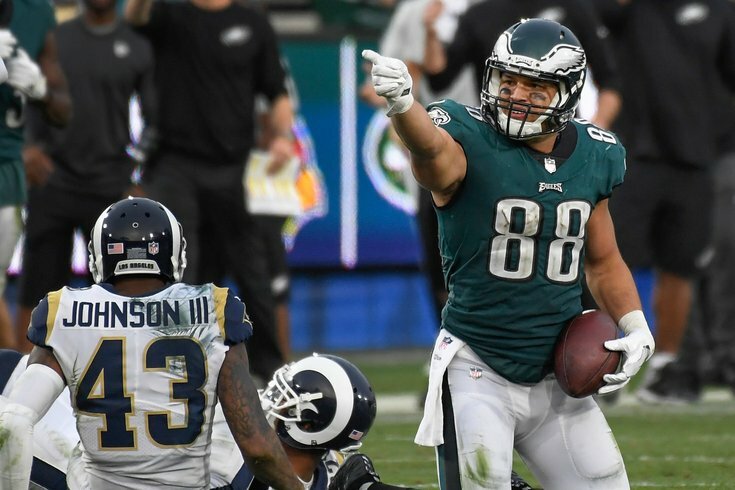 The short answer is that the Eagles are in line for an extra fourth-round pick and an extra sixth-round pick for the losses of Trey Burton and Beau Allen (or Patrick Robinson), respectively. However, it appears that Howie Roseman and the gang may have found a loophole in the system, potentially adding an extra sixth-round pick, per OverTheCap. Mike Wallace, who originally counted toward the formula in the cancellation chart above, may not count at all, after closer inspection on the crafty way Roseman and Jake Rosenberg structured his deal. The other unusual case involves Mike Wallace, going from Baltimore to Philadelphia. As I mentioned above, the Eagles are a team that have been largely ignored in recent comp pick studies, but historically this is mistaken to do so. From 2004 to 2011, the Eagles got multiple comp picks in six of those eight drafts, and were second only to Baltimore in the most total comp picks awarded. Howie Roseman was a high level executive with the team during those times, and looking at how he’s crafted some of his CFA signings, there are signs that he just as determined as Ozzie Newsome, Bill Belichick, or John Elway in manipulating the comp pick system. But it doesn’t end there. Wallace’s $1 million signing bonus is actually an OATSB–Other Amount Treated As Signing Bonus. OTC also believes that this OATSB is a guaranteed workout bonus. Although it’s unclear how the comp pick formula will judge such a payment, it has been very consistent in not counting workout bonuses of any kind. Because there are many signs suggesting that the Eagles are manipulating the formula with Wallace’s contract, I’m therefore guessing that this $1 million will not count either. If that guess is correct, all that’s left to count is Wallace’s veteran minimum base salary of $915,000, and while he could still qualify if he plays enough snaps, currently that’s not enough to break the current qualification limit of $1 million.